When you’re a kid, all you really want in life is to be first. No matter the situation – First in line! First one to the car! First one to finish dinner! – if you’re under the age of 10, you pretty much live life like Ricky Bobby: If you ain’t first, you’re last. The problem is this isn’t exactly a sustainable lifestyle. Along with the requisite shoves, scrapes, and tears that come with the pursuit of being the primary finisher, kids who operate this way – I’ll say it – end up being jerks. And no one wants his or her kid to be a jerk. So, I’ve spent a good portion of my (admittedly small number of) parenting years schooling my daughter in the fine art of waiting her turn. It took some patience on both of our parts, but I am proud to say that, now, she is damn good at waiting her turn. In fact, she’s almost too good, waiting so well that sometimes other, less-mannered kids will hop in front of her and take their turns while she continues to wait. We’re working on finding a balance. I had to draw on a bit of this patience myself when starting to throw the Leopard3, Innova Discs’ latest fairway driver. Because while I was expecting a legitimately understable flyer out of the box, I had to wait a bit for it to take its turn. Like other discs in Innova’s “3” series, the Leopard3 takes its namesake Leopard and augments it by adding a flatter top to give it more speed. The result has Innova placing the Leopard3’s flight numbers at Speed 7/Glide 5/Turn -2/Fade 1. Upon visual inspection, the Leopard3 does appear to have a flatter top than a standard Leopard, and it also has the same telltale bead-like elongation of the bottom of the rim as its predecessor. Looking more closely and holding the discs in hand, though, it seems like the two molds have different rim widths. According to Innova honcho Dave Dunipace, though, the two discs shape up the same, making the need for a new PDGA-approval a moot point. Dunipace attributed those variations to the aforementioned flat top. But that increased quality truly takes a backseat to the real byproduct of the 3 Series’ flat top: speed. Without a doubt, the Leopard3 is a fast fairway driver, leaving the original Leopard behind when thrown side by side. For those players who have employed the classic Teebird/Leopard fairway pairing for years but who were dissatisfied that their speeds didn’t jibe, the Leopard3 is the cure to your ills. This reverse question mark-shaped flight is one I haven’t seen too often in a premium plastic disc, and it’s quite useful once you can dial it in. It’s a bit unconventional, but it certainly opens up some new lines. It might just take a couple weeks for the pairing to mesh, though. Brand new, the L3 leaps out of the hand on a long, straight line that ends with a very negligible fade. With a surprising amount of high speed stability, I certainly wasn’t experiencing the -2 turn number that Innova advertises, but I also know that the Jolly Launcher Champion plastic the disc is molded in can increase initial stability. So, I wasn’t terribly concerned with the lack of wiggle when I first used it. Plus, it didn’t hurt that this thing was flying dead straight. It took me back to my days of throwing a seasoned DX Teebird, where it gets to the point in its evolution that it retains all of its stability early in the flight and loses all of its fade. It just becomes a laser, and that’s what this L3 was out of the box. After a couple weeks of throwing lasers with the Leopard3, though, I have to admit that I was growing impatient. Don’t get me wrong: Straight shots are fantastic. But I really wanted to see what the disc could do on a hyzer flip – which requires some turn but should be relatively easy to execute with a disc of this speed and understability – or a flat turnover line. And I just couldn’t make it happen. I know this is the plight of the noodle arm, in that I don’t always have the power to make something flip out of the box. The frustration was mounting, though, and I was ready to put the L3 back on the shelf for an extended holiday. Then, I took it for one last stroll in the park and unlocked its magic. Turns out (see what I did there?) the Leopard3 just needed a couple extra rounds of wear to show its true colors. And while the wait was a little discouraging, it was also worth the time. On that nice little walk in the park – I use the open space near my house as a mini object course – I saw that -2 turn number come to life in the form of a question mark. Or a backwards one, as it were. Indeed, what I started to find was that, on a flat release, the Leopard3 would still hold straight for about 60 percent of its flight, then take a late turn to the left (I throw lefty) before fading back to the center. This reverse question mark-shaped flight is one I haven’t seen too often in a premium plastic disc – base plastic, of course – and it’s quite useful once you can dial it in. It’s a bit unconventional, but it certainly opens up some new lines. The Leopard3 opens up the reverse question mark-shaped red route on Hole 10 at Kit Carson Park, but is just as comfortable holding the yellow hyzer line, too. Take, for example, Hole 10 at Kit Carson Park in Escondido, California. 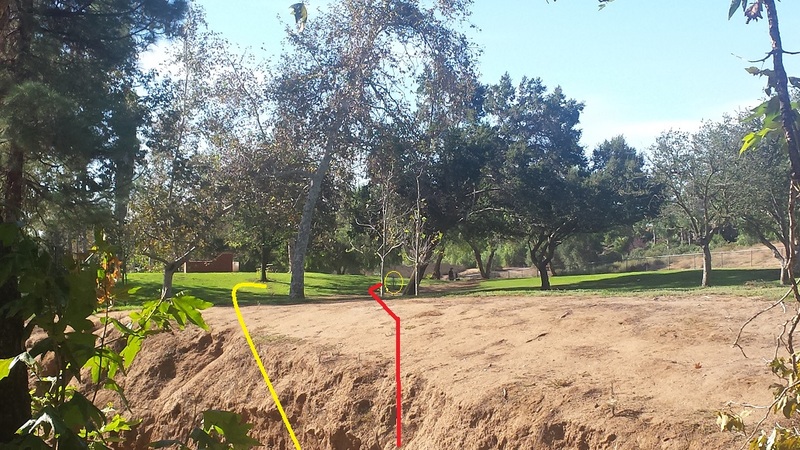 With a mostly-open line off the tee and the basket flanked by trees, I will normally throw a Discmania FD on a hyzer line out to the left (yellow line in the image) and play the fade and skip to end up next to the basket. It’s a reliable route, but if I ever pull my drive offline, there are some trees out to the left that leave me with an unforgiving lie. With the Leopard3, I can aim straight for the trees (red line in the image), use the late turn to work around them, and still end up parked. It’s nice to have these kinds of options with a fairway driver, as it makes for the need to carry fewer molds in the bag. I’m all for carrying less. With the Leopard3 entering the realm of Speed 7 drivers, there are some interesting comparisons one can make with the disc. A commenter on the Noodle Arm Disc Golf Facebook page last week opined that the L3 is Innova’s version of the aforementioned Discmania FD, and that’s not bad take. Both discs are fast, long for fairway drivers, and hold a tremendous amount of utility. But there are some notable differences. For one, the Leopard3, even when new, fades less than the FD. The L3 will also hold an anhyzer line longer than an FD before fading back, and is even easier to get to hold an anhyzer all the way to the ground. In my experience, the Leopard3 is more like a worn-in FD, so it can complement its cousin quite well. As for the original Leopard, it depends on the plastic that you’re comparing to. Champion Leopards are generally known to be a bit more overstable than their flight numbers suggest and take a long time to gather any wear. The Leopard3, on the other hand, doesn’t ever have a beefy fade to it and takes only a few weeks to start turning. If I had to put a label on it, I’d say the Leopard3 is like a longer Pro Leopard – the ones that turn easily and can be used on many lines – in a premium plastic blend. In the end, then, I’d call the Leopard3 an improvement on the original. Blasphemy? Sure, if you’re a disciple of the Church of the Leopard. But it seems that Innova certainly set out to bring something new to the table that the original wildcat wasn’t providing, and this newer, sleeker version succeeds. 2) LIKE Innova Discs (like you don’t already). 3) LIKE and COMMENT on the pinned post for this review at the Noodle Arm Disc Golf Facebook page. For your comment, tell me about something you absolutely couldn’t wait for as a kid. Christmas vacation? That awesome sequel to the Teenage Mutant Ninja Turtles movie? The toy at the bottom of the cereal box? If it made you squirm with impatience, I want to hear about it. 4) SHARE the review – either on Facebook or Twitter – for an extra entry. The contest will run until Thursday, November 12 at 9 p.m. PDT, when three random winners will be chosen. Good luck, and thank you to Innova for providing the plastic!